ARE THE DISCOVERERS OF PINGUICULA LAZY OR NOT ? Read the article and vote. May 11th, 2008 : Birth of the Pinguicula cooperative bank of seeds. September 8th, 2010 : Rare pictures of Pinguicula albida in habitat sent again by Yoannis. September 7th, 2010 : Rare pictures of Pinguicula filifolia in habitat sent by a PhD, Yoannis Dominguez Rodriguez. His PhD theme is Population dynamics and genetic structure of Cuban Pinguicula species...what a dream for many people. More soon. January 8th, 2010 : A new article to read : " A 5600 kms tour in Mexico Part 12 " from Oliver Gluch with pictures from Radek Kastner and Oliver in the article area. Update of the page on Pinguicula calderionae with pictures of the original habitat and plants by Radek Kastner. January 5th, 2010 : A new article to read on " Postcard from Mexico N°26 from Fernando Rivadavia : Northeastern Pings " by Fernando Rivadavia in the article area. Discover P. gracilis in habitat for the first time but also P. rotundiflora, P. immaculata and P. jaumavensis !. January 4th, 2010 : A new article to read : " A 5600 kms tour in Mexico Part 11 " from Oliver Gluch in the article area. January 2nd, 2010 : A new article to read : " A 5600 kms tour in Mexico Part 10 " from Oliver Gluch in the article area. December 30th, 2009 : A new article to read : " A 5600 kms tour in Mexico Part 9 " from Oliver Gluch in the article area. December 28th, 2009 : Update of the page on Pinguicula bohemica with addition of pictures in habitat and notes by Adam Veleba. December 22th, 2009 : A new article to read : " A 5600 kms tour in Mexico Part 8 " from Oliver Gluch in the article area. December 21th, 2009 : A new article to read : " A 5600 kms tour in Mexico Part 7 " from Oliver Gluch in the article area. December 18th, 2009 : Update of the page on Pinguicula acuminata with pictures of two original habitats in El Chico National Park, by Radek Kastner. December 16th, 2009 : A new article to read : " A 5600 kms tour in Mexico Part 6 " from Oliver Gluch in the article area. December 15th, 2009 : Update of the page on Pinguicula crassifolia with more pictures of the original habitat with a revisiting of the site after 6 years since Fernando's travels by Radek Kastner. December 14th, 2009 : Update of the page on Pinguicula 'ANPA' with many pictures of the original habitat of the plants and update of the page on Pinguicula ibarrae with a revisiting of the site after 6 years since Fernando's travels by Radek Kastner. December 11th, 2009 : Update of the page on Pinguicula elongata with many pictures of Philippe Courtel and growing tips from amateurs. December 10th, 2009 : A new article to read : " A 5600 kms tour in Mexico part 5" from Oliver Gluch in the article area. December 9th, 2009 : Update of the page on Pinguicula potosiensis with pictures from Radek Kastner, member of the 5600 km tour in Mexico. December 3th, 2009 : A new article to read : " A 5600 kms tour in Mexico part 4" from Oliver Gluch in the article area. November 23th, 2009 : A new article to read : " A 5600 kms tour in Mexico part 3" from Oliver Gluch in the article area. November 16th, 2009 : A new article to read : " A 5600 kms tour in Mexico part 2" from Oliver Gluch in the article area. November 11th, 2009 : A new article to read : " A 5600 kms tour in Mexico " from Oliver Gluch in the article area. THE HOST OF A SMALL PART OF "A WORLD OF PINGUICULA" ERASED THE PAGES THERE. I MUST RE-HOST THESE PAGES IN MY MAIN HOST AND UPDATED ALL THE LINKS. Sorry for inconveniant. May 10th, 2009 : A new article to read on " Postcard from Mexico N°25 from Fernando Rivadavia : Moctezuma Canyon " by Fernando Rivadavia in the article area. Discover P. moctezumae in habitat for the first time !. February 23th, 2009 : A new article to read on " Postcard from Mexico N°24 from Fernando Rivadavia : LA FLORIDA" by Fernando Rivadavia in the article area. Discover P. lilacina and P. moranensis in habitat in La Florida. January 27th, 2009 : A new article to read on " Postcard from Mexico N°23 from Fernando Rivadavia : San Luis Potosi" by Fernando Rivadavia in the article area. Discover P. martinezii and P. moranensis in habitat in Sierra Gorda. January 25th, 2009 : A new article to read on " Postcard from Mexico N°22 from Fernando Rivadavia : San Luis Potosi" by Fernando Rivadavia in the article area. Discover P. takakii and P. gypsicola in habitat and P. moranensis. January 5th, 2009 : A new article to read on " Postcard from Mexico N°21 from Fernando Rivadavia : JALISCO & COLIMA" by Fernando Rivadavia in the article area. Discover P. colimensis in habitat. January 1st, 2009 : Happy new year ! August 21th, 2008 : Update of the Pinguicula cooperative bank of seeds. July 28th, 2008 : A new article to read on "OLIVER'S MEXICAN TRIP N° 1" by Oliver Gluch in the article area and update (with bad news) of the article of Andreas Fleischmann on P. leptoceras in habitat. July 27th, 2008 : Update of the Pinguicula cooperative bank of seeds. May 29th, 2008 : P. leptoceras in habitat in Austria by Andreas Fleischmann. May 17th, 2008 : The back issues of the IPSG (International Pinguicula Study Group) is now on-line. Follow this link to the ICPS website. December 2006 to April 2008 : Sorry, no updates. The death of my father was the main reason and other various problems as consequences of this. I want to apologies to everybody for having been away. Many thanks for the people that helped me for going on. November 8th, 2006 : Two new articles to read on Mexican Pinguicula : " Quest for the holy grail " and " Pinguicula laxifolia in habitat " from Noah Elhardt and Forbes Conrad, the barefoot boys in the article area. November 7th, 2006 : Two new articles to read on Mexican Pinguicula : " Pinguicula hemipepiphytica in habitat " and " Pinguicula heterophylla in habitat in Oaxaca " from Noah Elhardt and Forbes Conrad, the barefoot boys in the article area. November 5th, 2006 : Three new articles to read on Mexican Pinguicula : " Pinguicula orchidioides in habitat ", " Pinguicula laueana in habitat " and " P. orchidioides and P. heterophylla in habitat " from Noah Elhardt and Forbes Conrad, the barefoot boys in the article area. November 4th, 2006 : A new article to read on Mexican Pinguicula : " P. moranensis - 2 variable sites from Oaxaca, Mexico. " from Noah Elhardt and Forbes Conrad, the barefoot boys in the article area. November 3th, 2006 : A fourth and a fifth article to read on Mexican Pinguicula : " Pinguicula medusina in habitat " and " Pinguicula conzattii " from Noah Elhardt and Forbes Conrad, the barefoot boys in the article area. November 2nd, 2006 : A second article to read on Mexican Pinguicula : "... anensis, anensis, and more anensis..." and a third article to read on Mexican Pinguicula : " Pinguicula parvifolia in habitat " from Noah Elhardt and Forbes Conrad, the barefoot boys in the article area. November 1st, 2006 : A new series of articles to read on Mexican Pinguicula "Pinguicula oblongiloba in Michoacan, Mexico." from Noah Elhardt and Forbes Conrad, the barefoot boys in the article area. September 10th, 2006 : A new article to read on "Postcard from Mexico N°20 from Fernando Rivadavia : Taxco & Tejupilco" by Fernando Rivadavia in the article area. August 17th, 2006 : A new article to read on "Postcard from Mexico N°19 from Fernando Rivadavia : Moctezumae and Sierra Gorda" by Fernando Rivadavia in the article area. August 15th 2006 : happy birthday "A world of Pinguicula" on-line since 2002. Many thanks to all contributors. August 4th, 2006 : Follow us in visiting P. alpina in habitat in north Italy by Andrea Guipe in the article area. August 3th, 2006 : A new article to read on "Postcard from Mexico N°18 from Fernando Rivadavia : Exploring the Toliman Canyon, Hidalgo State" by Fernando Rivadavia in the article area. August, 2nd, 2006 : update of the page of Pinguicula elizabethiae with pictures of habitat from Fernando Rivadavia. July 25th, 2006 : update of the page of Pinguicula agnata with pictures of the holotype habitat from Fernando Rivadavia. July 24th, 2006 : A new article to read on "Postcard from Mexico N°17 from Fernando Rivadavia : Pinguicula Hunting in Mexico with the Barefoot Boys" by Fernando Rivadavia in the article area. July 23th, 2006 : A new article to read on "Postcard from Mexico N°15 from Fernando Rivadavia : CPs IN GUERRERO" by Fernando Rivadavia in the article area. July 22th, 2006 : A new article to read on "Postcard from Mexico N°16 from Fernando Rivadavia : Colonial History, Mummies & Pinguicula in Guanajuato" by Fernando Rivadavia in the article area. July 16th, 2006 : New page on Pinguicula zecheri with the first ever published pictures in habitat by Ruben Resendiz Torreblanca and Fernando Rivadavia. July 15th, 2006 : Update of the page on Pinguicula hemiepiphytica with pictures in habitat by Oliver Gluch with pictures in habitat from Ruben Resendiz Torreblanca. July 14th, 2006 : Update of the page on the population of Pinguicula ehlersiae from Tolantongo with pictures in habitat from Ruben Resendiz T.
May 21th, 2006 : Update of the page on Pinguicula crystallina subsp. hirtiflora with pictures from Markus Welge and more on the natural or introduced status of the Roya Valley population. February 26th, 2006 : Update of the page on Pinguicula nivalis with pictures in culture from Markus Welge. February 17th, 2006 : Ruben Resendiz is back ... with Pinguicula ehlersiae in habitat in El parador, Tepozan in Queretaro state. Have a look in the article area for others articles. Update of the page on Pinguicula colimensis with pictures in habitat from Oliver Gluch. February 8th, 2006 : Update of the page on Pinguicula gigantea with pictures from Vic Brown. February 5th, 2006 : Update of the page on Pinguicula bohemica with many pictures from Jan Flisek. December 17th, 2005 : Follow us in visiting a population of Pinguicula oblongiloba in habitat near Jiquilpan, Michoacan, Mexico by Carlos Cuellar Maravilla in the article area. December 14th, 2005 : New growing list of Valentin Schatz, from Germany in the swap area. September 18th, 2005 : Follow us in visiting a population of Pinguicula parvifolia in wild in Camino a Chalma, Morelos, Mexico by Enrique Dada in the article area. Update of the page of P. gypsicola with new pictures from Markus Welge. September 17th, 2005 : Follow us in visiting a population of Pinguicula lilacina in wild in El Castillo, Veracruz, Mexico by Enrique Dada in the article area. July 17th, 2005 : New page on Pinguicula ibarrae. July 15th, 2005 : update of the page of the swap corner with the listing of Peter Harbarth (Germany). March 31th, 2005 : New page on Pinguicula villosa, with pictures of Dr. Heiko Rischer. March 6th, 2005 : New page on Pinguicula bissei, one of the new species from Cuba described by S.J. Casper. March 4th, 2005 : Two new species from Cuba described by S.J. Casper (see hot news). February 27th, 2005 : update of the page on Pinguicula jaumavensis with pictures of Vic. Brown. February 1th, 2005 : update of the growing list of Bonnie in the swap area. November 18th 2004 : update of the page of Pinguicula vulgaris f. bicolor with pictures from JEFF. November 8th 2004 : new page on Pinguicula nivalis published. November 1st 2004 : update of the page of Pinguicula chilensis with many pictures from Oliver Gluch's travel in Chili and update of the page of Pinguicula heterophylla with many pictures of this species in culture from Ruben Resendiz. October 25th 2004 : update of the page on Pinguicula crenatiloba with numerous pictures of Ruben Resendiz. September 16th 2004 : update of the page in the virtual visits area with Oliver Gluch's new greenhouse (first shot). September 14th 2004 : A new article to read on "Postcard from Mexico N°14 from Fernando Rivadavia : A trip through Chiapas & Oaxaca (- Part 5 -)" by Fernando Rivadavia. September 11th 2004 : The first ever published pictures of P. elizabethiae flowering in culture in one of the best grower collection : Oliver Gluch. September 5th 2004 : Follow us in visiting JEFF's multi-genus CP collection in the virtual visits area. August 28th 2004 : A new article to read on "Postcard from Mexico N°14 from Fernando Rivadavia : A trip through Chiapas & Oaxaca (- Part 4 -)" by Fernando Rivadavia. August 25th 2004 : A new article to read on "Postcard from Mexico N°14 from Fernando Rivadavia : A trip through Chiapas & Oaxaca (- Part 3 -)" by Fernando Rivadavia. August 21th 2004 : A new article to read on "Postcard from Mexico N°14 from Fernando Rivadavia : A trip through Chiapas & Oaxaca (- Part 2 -)" by Fernando Rivadavia. August 19th 2004 : A new article to read on "Postcard from Mexico N°14 from Fernando Rivadavia : A trip through Chiapas & Oaxaca (- Part 1 -)" by Fernando Rivadavia. August 17th 2004 : update of the page on Pinguicula from sumidero with pictures from Fernando Rivadavia. August 15th 2004 (my birthday) : " Follow us in discovering : the Lake of Forlet, France, Vosges" and " Follow us in discovering : the Col of Marie-Blanque, Pyrenees, France " two new postcards to see in the article area. New page on Pinguicula 'ANPA' complex to be building up. August 8th 2004 : "Jan FLISEK's 2004 Holydays", a nice postcard to see in the article area. August 4th 2004 : Addition of a specific search engine for A WORLD OF PINGUICULA. August 2nd 2004 : A new fantastic article to read on " European Pinguicula : alternative cultivation method." by Iwein Coppens (articles page : go here) Unbelievable ! July 24th 2004 : I want to anounce the availability of a new phpBB spanish speaking forum by Sebastian Vieira and Ruben Resendiz. Both are well known by the visitors of this forum for their articles. Have a look on the forum page. I am really happy with this new birth. Good luck friends ! May 28th 2004 : Follow us in visiting Vic Brown's multi-genus CP collection in the virtual visits area. May 26th 2004 : update of the page on Pinguicula medusina and P. debbertiana with pictures from Vic Brown. May 18th 2004 : New page published on the famous Stan Lampard's open day in the virtual visits area with pictures from Vic Brown. May 16th 2004 : New page published on Pinguicula grandiflora f. chionopetra and update of the page on Pinguicula lusitanica with pictures of Luc Buze and the pages of : Pinguicula from Huahuapan, Pinguicula potosiensis and P. debbertiana with pictures from Vic Brown. May 11th 2004 : Update of the page on Pinguicula longifolia subsp. reichenbachiana with a picture from Filippo Tassara. May 4th 2004 : Update of the page on Pinguicula corsica with many pictures of P. corsica f. pallidula from Serge Lavayssiere. May 2nd 2004 : Update of the pages on Pinguicula balcanica with a picture of the white/light pink form and of the Bizarre Gallery : page 5 with anomalous flower from Vic Brown. May 1st 2004 : New page on Pinguicula ramosa published. April 28th 2004 : Update of the page on Pinguicula heterophylla with pictures from Markus Welge. April 1st 2004 : "A new Pinguicula species discovered by Fernando Rivadavia in Mexico with large red flowers, each inflorescence with up to 5 flowers!" have a look here : link. March 31th 2004 : Update of the page on Pinguicula emarginata with pictures in wild from Fernando Rivadavia. March 13th 2004 : Update of the page on Pinguicula laueana with a picture of another clone by Vic Brown and new page on Pinguicula leptoceras published. March 12th 2004 : Update of the Bizarre Gallery : page 4 with anomalous flowers in wild by Fernando Rivadavia. March 3th 2004 : New page on Pinguicula ehlersiae. March 2nd 2004 : A virtual visit of the greenhouse of Ruben Resendiz. March 1st 2004 : A new article to read on "An unforgettable population of Pinguicula longifolia subsp. longifolia" by Eric Partrat (articles page : go here). February 24th 2004 : update of the pages on Pinguicula rotundiflora and Pinguicula lusitanica with pictures of Markus Welge and the first picture in the bizarre gallery for 2004. February 22th 2004 : New page on Pinguicula rotundiflora published. February 21th 2004 : update of the page on Pinguicula benedicta with pictures of Stefan Ippenberger and on the YuccaDO Complex with pictures of Vic Brown. February 19th 2004 : Pinguicula involuta in its habitat in Peru can be discovered in the postcard N°8 from famous Fernando Rivadavia. February 14th 2004 : Do you know what Fernando Rivadavia has done during his holydays after many CP trips in Mexico ? Well, hunting CP in Peru : new page : Pinguicula involuta. January 27th 2004 : A new multi-genus grow-list added in the swap corner area : Aurelien from France. January 19th 2004 : New page on Pinguicula planifolia. January 18th 2004 : A new Pinguicula grow-list added in the swap corner area : Jan Flisek from Czech republic. January 17th 2004 : New page on Pinguicula albida with numerous pictures of Jan Flisek. January 15th 2004 : Update of the growing list of Vic. Brown (UK) in the swap corner area. January 14th 2004 : Update of the pages on P. conzatii, P. immaculata, P. gracilis, P. laueana and Pinguicula crystallina subsp. hirtiflora with addition of some of the impressive pictures of Vic. Brown. 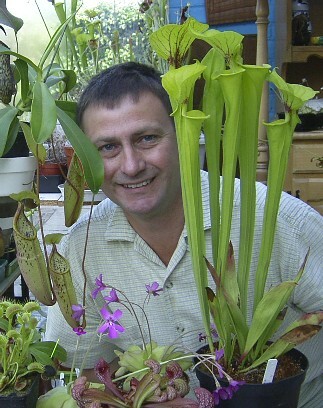 January 12th 2004 : Update of the page on Pinguicula elizabethiae with a picture of Jan Flisek. January 11th 2004 : Some hot news to read. January 1th 2004 : Happy new year ! December 29th 2003 : New page on Pinguicula ionantha with pictures of Bob McMorris. December 19th 2003 : A new Pinguicula grow-list added in the swap corner area : Ruben Resendiz from Mexico. December 18th 2003 : update of the pages on Pinguicula emarginata and Pinguicula primuliflora with pictures of Markus Welge. December 16th 2003 : A new Pinguicula grow-list added in the swap corner area : Markus Welge from Germany. December 13th 2003 : New page on Pinguicula pumila with pictures of Bob McMorris and Dieter Kadereit. December 8th 2003 : update of the page on Pinguicula lutea with pictures of Bob McMorris and on Pinguicula calderoniae with pictures of F. Rivadavia. November 26th 2003 : A new Pinguicula grow-list added in the swap corner area : Bonnie from USA (Alaska). November 25th 2003 : A new page on Pinguicula jaraguana added. Have you also heard of "Plantas Carnivoras", a forum on CP from the spanish speaking world. More on the Forum area (scroll down and enjoy). November 16th 2003 : Two new Pinguicula grow-list added in the swap corner area : Stefan Ippenberger and Stefan Lenßen, both from Germany. November 2nd 2003 : New page on Pinguicula moranensis var. neovolcanica. October 26th 2003 : update of the page on Pinguicula macroceras with addition of pictures in wild from Prof. Kondo and Hiro Shimai (two locations), update of the page on Pinguicula 'Pico de Orizaba' and on Pinguicula crassifolia. October 25th 2003 : update of the page on Pinguicula lusitanica with addition of close-up pictures in wild from Lionel Dromard. October 23th 2003 : update of the page on Pinguicula acuminata with addition of pictures in wild from Ed. Read and on Pinguicula heterophylla with pictures of Ruben Resendiz. update of the article on the famous "Herbario Nacional MEXU"
October 2nd 2003 : New pages in the chapter "Hosts around our Pinguicula : allies, neutral or enemies ?" with crane fly and spider mites pages. You can have a preview here : (Caterpillar and Aphids only) and send us all contributions as usual. September 14th 2003 : New article on the famous "Herbario Nacional MEXU"
September 13 th 2003 : Update of the article on "The Pinguicula from The Yucca Do complex " by Travis Wyman (articles page : go here) with the field notes of Tony Avent. Thanks Michael. September 9th 2003 : August 4th 2003 : new page on Pinguicula primuliflora. June 18th 2003 : Update of "The Bizarre gallery". June 15th 2003 : New Pinguicula grow-list of Ed. Read (USA) in the swap corner area. June 14th 2003 : CARNIBANK, The non-commercial seed-exchange bank working in a cooperative way is on-line. June 8th 2003 : New page on Pinguicula lusitanica, Update of "The Bizarre gallery". June 7th 2003 : Some hot news to read .... : Pinguicula calderoniae, Pinguicula infundibuliformis and Pinguicula jaraguana. June 6th 2003 : updates of the pages on P.cyclosecta and P. parvifolia with pictures of flowers. June 1st 2003 : back from a Pinguicula trip in Pyrenees. May 28 th - 30th 2003 : updates of the pages on P. rectifolia and Pinguicula from Tonola with pictures of flowers. April 30th 2003 : New page on Pinguicula dertosensis. April 29th 2003 : New page on Pinguicula vallisneriifolia. Update of "The Bizarre gallery". April 28th 2003 : Have you heard about "The carnivorous garden" that will be opened in July 2003 : link. Some pictures from the famous carnivorous plants nursery "Nature et Paysage" can be seen also there : link. Update of the page on P. longifolia subsp. longifolia with new pictures. April 27th 2003 : Some hot news to read ..., new pages in french by Ferreol Braud. April 25th 2003 : New page on Pinguicula nevadensis. April 24th 2003 : New page on links to forums on Pinguicula (and other CP). New article to read on "Pinguicula distribution, growth habit" (articles page : go here). New articles to read : do you know "what is a type specimen" and how "correctly writing plant names", "seeds cleaning", "Seeds pack construction" and "Seeds storage" (articles page : go here). Updates : addition of many informations on P. hemiepiphytica page (climat, threats, vegetation...). addition of pictures of Jan Flisek on the page of P. crassifolia, sad news for Pinguicula poldinii. New pages on : Pinguicula elongata, Pinguicula from Xichu, Pinguicula chilensis, Pinguicula calyptrata, Pinguicula vulgaris f. bicolor, Pinguicula macroceras subsp. nortensis, Pinguicula elizabethiae, Pinguicula moctezumae and on Pinguicula from Huahuapan. January 28th 2003 : The pictures in habitat of the Pinguicula found by David Kirkbright in 1987 in Mexico and grown under the name P. moranensis 'kirkbright' are on-line now. New member's Pinguicula growing list on-line. January 24th 2003 : Have you heard about Pinguicula conzatti ? See the news and the pictures of Oliver Gluch of this new describe species in P. mirandae page. New pages on : Pinguicula from Sierra Obscura, undescribed up to now, Pinguicula stolonifera, Pinguicula casabitoana, Pinguicula lignicola, Pinguicula x 'Seductora', P. agnata x P. emarginata, Pinguicula from Cantina dels Racons (Allen Lowrie's seeds catalogue) and Pinguicula x scullyi. New pages on : Pinguicula from Tonala, Pinguicula balcanica, Pinguicula grandiflora f. pallida, Pinguicula longifolia subsp. reichenbachiana, Pinguicula laueana, Pinguicula moranensis 'El Chico' (P.moranensis var. neovolcanica), Pinguicula from Tehuacan, Pinguicula mirandae, Pinguicula mesophytica. Update of the page of P. moranensis 'Kirkbright' : All the informations by D. Kirkbright himself, new galleries with bizarre Pinguicula, on visits of Stephane Joly's greenhouse, on Laurent Legendre and Serge Lavayssiere's Terrarium, on visit of Jurg Steiger's greenhouse, on sub-classification of Pinguicula species, new presentation-page on myself and publications, new content on the page on growing Pinguicula, addition of Pierre Gelinaud's page on substrates, on vegetative reproduction of Mexican Pinguicula by Serge Lavayssiere, on in-vitro culture by Laurent Legendre. New page on culture of Mexican Pinguicula by Eric Partrat and Serge Mallet. New pages on Pinguicula esseriana, Pinguicula cyclosecta, Pinguicula gigantea, Pinguicula from Zacapoaxtla, Pinguicula emarginata, Pinguicula immaculata, Pinguicula moranensis 'white flower', P. crassifolia, P. jaumavensis, P. grandiflora subsp. rosea, Pinguicula from Pachuca, P. debbertiana, P. rectifolia. New pages on Pinguicula gracilis, Pinguicula potosiensis, Pinguicula corsica, Pinguicula moranensis 'Rio Grijalva', Pinguicula from 'Puerto del Gallo', Pinguicula moranensis 'Morelia', Pinguicula 'Ayautla', Pinguicula greenwoodii, Pinguicula 'Kirkbright', Pinguicula crenatiloba, Pinguicula longifolia subsp. longifolia, Pinguicula heterophylla, Pinguicula alpina, Pinguicula macrophylla, Pinguicula agnata, Pinguicula longifolia subsp. caussensis, and Pinguicula crystallina subsp hirtiflora. New pages on Pinguicula acuminata, Pinguicula sp 'Sierra Mazatecas', Pinguicula sp 'Synalta'. August 15th 2002 : birth of a "A world of Pinguicula on-line".